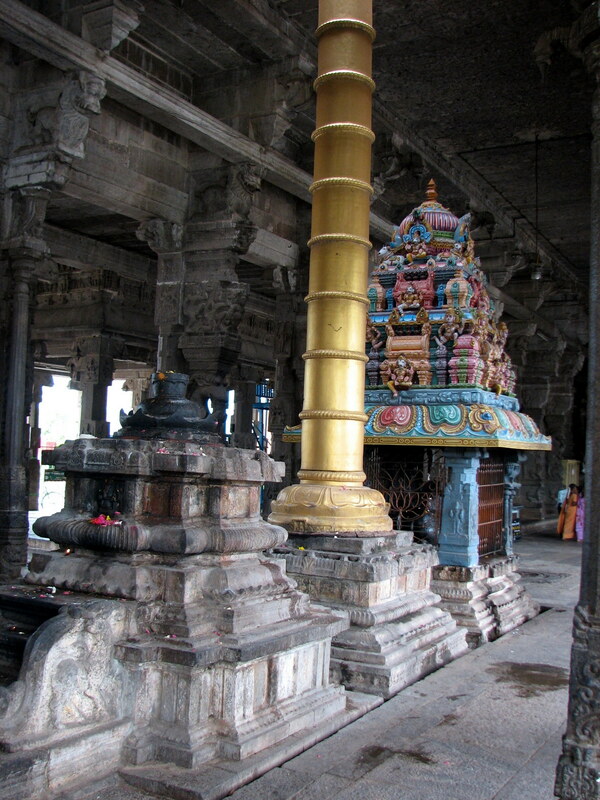 Thiru Nilathingal Thundam is one of the 108 Divya Desams of Lord Vishnu situated within the temple precincts of Sri Ekambareshwarar Temple; one of the Pancha Boothasthal of Lord Shiva represents Earth. This temple is located in Kanchipuram District, Tamil Nadu. This is one of the oldest temples situated from the date back to 600 A.D. built by the Pallava Kings; Kings of Chola Dynasty also have made abundance of contributions to this temple. The tallest majestic Rajagopuram of this temple was built by the King of Vijayanagara Sri Krishna Devaraya. 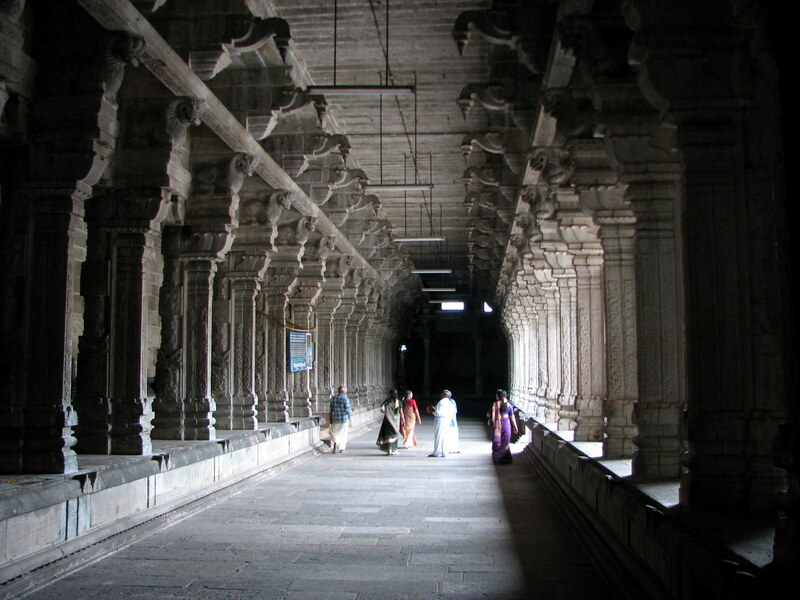 The most attractive thousand pillars Mandap was also the contributions of Vijayanagara Kings. Mother Mahalakshmi has Her abode in the heart of Lord Vishnu on the left. Here, She graces the devotee from the naval chord lotus of the Lord generally belonging to Lord Brahma. Brahma creates beings with an order of life that may be good or bad for them based on their past births, according to our beliefs and scriptures. Worshipping Mahalakshmi in this temple, reverses the adverse effects on the devotee originally fixed by Brahama. Lord Perumal blesses His devotees seeking child boon. It is noteworthy that Mother Parvathi was relieved of the curse of Lord Shiva for closing His eyes though in a playful mood. It is here Lord Perumal too got His vision restored by Lord Shiva, according to some stories. It is said that Lord Shiva used Holy Ganga for Parvathi and the Crescent Moon for Perumal to grace them. Worshipping Lord Ekambareswara and Lord Nilathunda Perumal together would promote more affection between brothers and sisters, it is advised. Lord Nilathnda Perumal blesses the devotees in a shrine in the first prakara in standing form under the Purusha Suktha Vimana. As He came alone here for a remedy, there is no shrine for Mother. However, Mother Mahalakshmi is worshipped in a formless manner – Ner Uru Illa Thai – Mother without a form as She is believed merged with the Lord. As Lord was cured by Lord Shiva, pujas to Perumal are performed in accordance with Saivite codes. To reduce the excessive heat in His body, perfumed oil is applied instead of abisheks. As the rays of crescent moon – Nila Thundu – fell on Him, Lord is named Nilathunda Perumal. He is also praised as Chandra Chooda Perumal. The Mangala Sasanam hymn of Tirumangai Azhwar describes this story. The legend has that Goddess Parvati underwent severe penance to attain Lord Shiva as her husband. In order to test her devotion Lord Shiva originated massive fire on the mango tree where Goddess Parvati was seated and engrossed in meditation. Goddess Parvati earnestly prayed to Lord Vishnu- Sri Nilathingal Thundathan to cool down the environment. Lord Vishnu instructed Lord Chandra who was residing in the matted hair of Lord Shiva to shower his breezy air to control the scorching heat. At last, everything reinstated to normalcy and Goodess Parvati continued her penance. 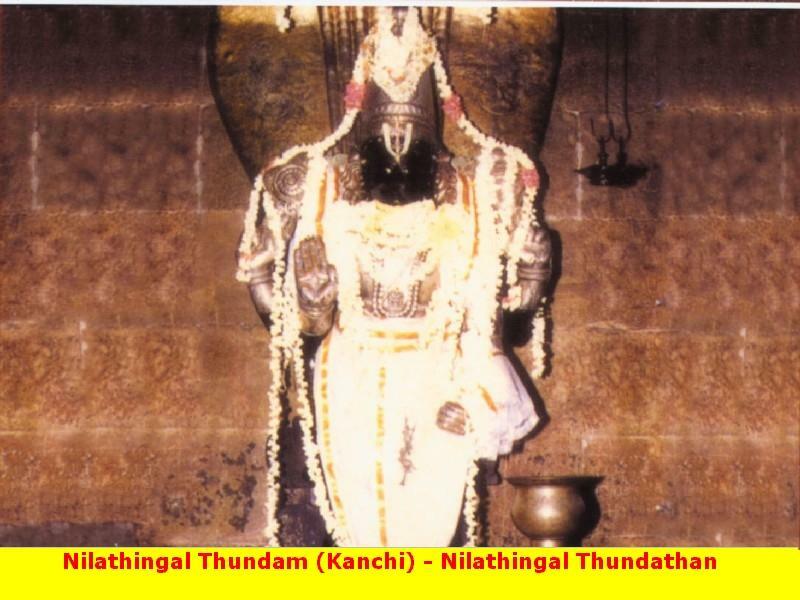 Thus, Lord Vishnu in this temple had known ‘Thiru Nilathingal Thundan’. Lord Maha Vishnu took the form of Tortoise (Koorma Avatara) to the hold the Meru Mount used as the stick (Mathu in Tamil) to churn the milk ocean. Serpent Vasuki was used as the rope. Vasuki, exhausted during this exercise, split its venom which fell on the Tortoise Vishnu under the milk ocean blackening His skin originally alluring pale blue. Treatments were of no avail. Lord Brahma suggested that worshipping Lord Shiva will remove the blackness and restore His original shade. 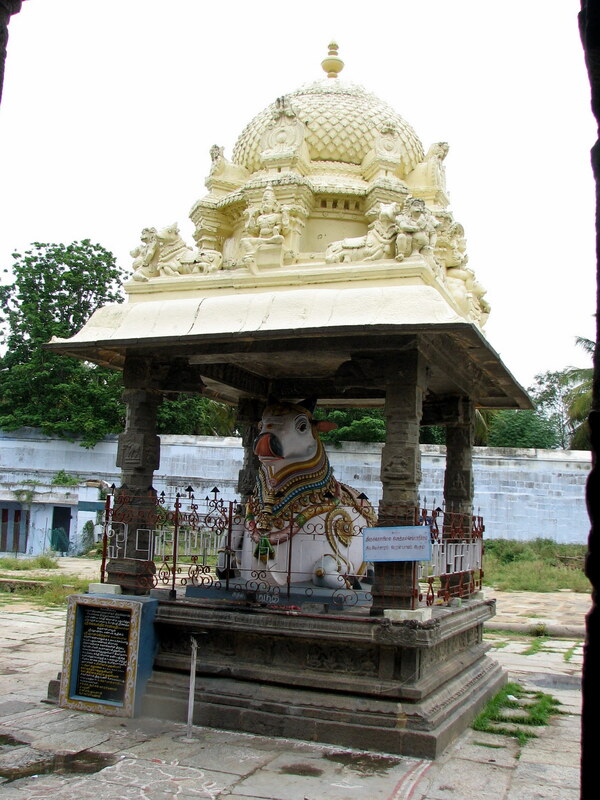 Perumal performed penance on Lord Shiva, who granted darshan. Crescent Moon on the head of Lord Shiva spread his rays on Perumal. Black disappeared. He recovered His own alluring blue shining better than before. 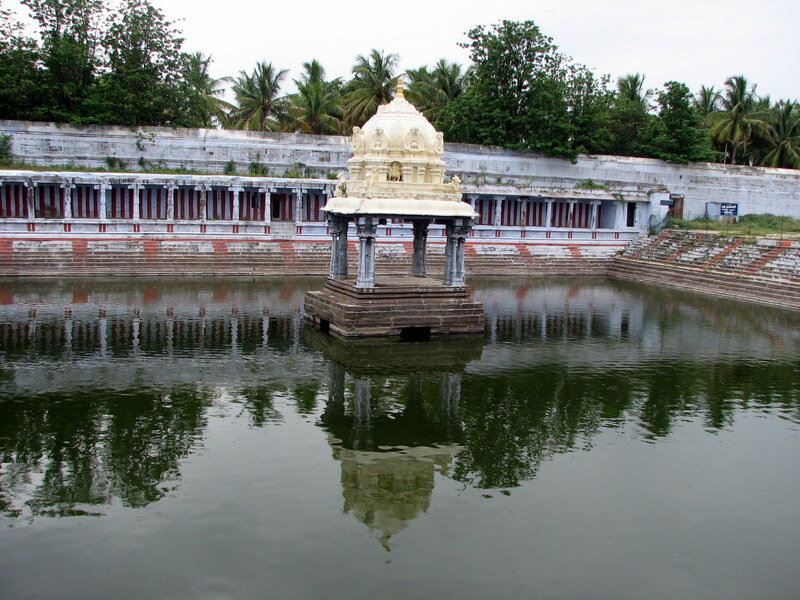 Lord Ekambareswarar Temple was built on the background of this story. As Perumal got back His skin colour as before through rays of Moon, He is praised as Nila Thunda-crescent moon-Perumal. The shrine is in the Easanya corner – north east - of the temple. 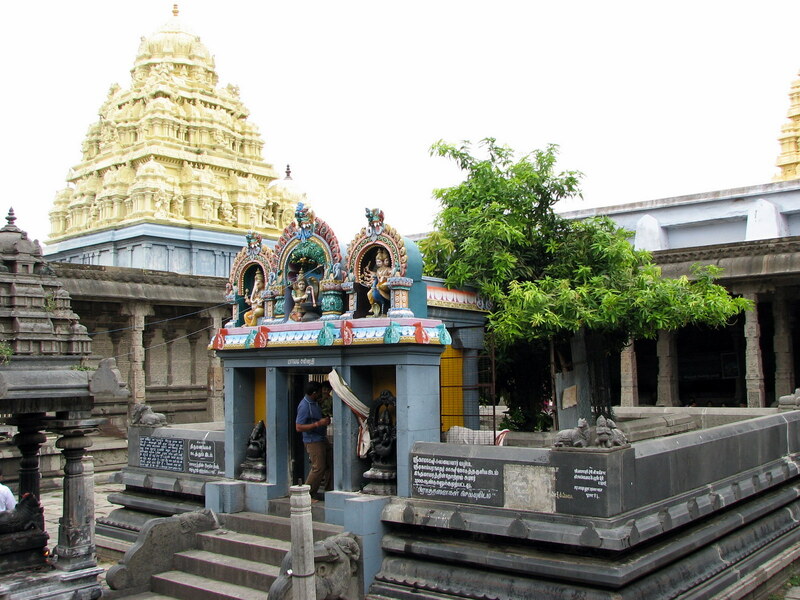 This is a temple in a temple – Vishnu temple in Shiva temple. This is praised as one of the 108 Divya Desas of Lord Vishnu. Those suffering from skin and stomach diseases and any adverse evil effects and excessive heat in the body pray to Perumal and for child boon. Perumal darshan also ensures affinity between mother and son. Festival: Lord bearing the light of moon, every poornima day – full moon day is a festival day in the temple. Purattasi Saturdays of September-October and Vaikunda Ekadasi in December-January are other festivals observed in the temple. 06:00 am to 12:30 pm ; 04:00 pm to 08:30 pm. 3 kms from Bus Stand. In side the Ekambareswarar Temple.